From San Francisco to Munich to Las Vegas and beyond, mercenary mage Sera Dering faces her biggest challenge yet in this final installment of the bestselling Dragon Born Serafina series. After twenty-four years of pretending to be human, Sera is adjusting to her new life with magic and a deepening relationship with dragon shifter Kai. But her magic is put to the test when the Grim Reaper, an immortal mage with godlike powers, begins to weave his sinister enchantments over the supernatural community. To defeat him, she has to ally with the very people who condemned her kind to death—and if they discover what she is, they will turn on her instead. 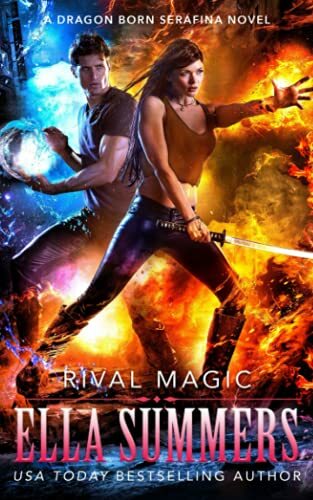 Rival Magic is the fourth book in the Dragon Born Serafina urban fantasy series. Ella Summers has been writing stories for as long as she could read; she's been coming up with tall tales even longer than that. One of her early year masterpieces was a story about a pigtailed princess and her dragon sidekick. Nowadays, she still writes fantasy. She likes books with lots of action, adventure, and romance. When she is not busy writing or spending time with her two young children, she makes the world safe by fighting robots. Ella is the USA Today, Wall Street Journal, and International Bestselling Author of the paranormal and fantasy series Legion of Angels, Dragon Born, and Sorcery & Science.